This Monster 6 inch dredge is truly the top of the line. Twin 7 Horsepower Subaru motors and pumps move all the water and material you can dream of. If you are serious this is the dredge for you. email me at mini4x4@cableone.net or use my feedback form on my main page. Free shipping to Boise. 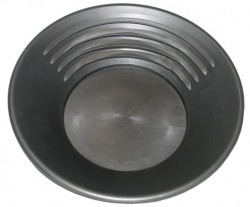 One of our favorites is this 10 inch dark grey gold pan. It is dark enough to see the Gold easily and still just light enough to see the black sands against. This will help you become a better panner in no time at all. The same dark grey color as the pan above but this one measures 14 inches across and has 4 Gold grabbing riffles instead of two. 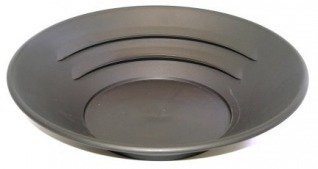 Both sizes of pans above also available in a hard to loose shade of Orange. Gold and Black sand are still very easy to see on this color. A truly proffesional pan that even the kids will love.